The market is flooded with handgun safes and pistol safes that offer convenience and fast access. What most lack, however, is security. Many pistol safes are actually not safe at all against burglars. Plenty of them can be opened with a screwdriver, a piece of wire or even a paper clip. Most popular models are made with steel as thin as 16, 18, or even 20 gauge, .0598” and .0478”, and .0359″ respectively. You can bend steel that thin with your hands. Weak latch systems can be broken easily. For instance, a thin wire loop which is held by a spring loaded catch can be quickly broken or cut. Batteries on electronic locks can fail at the worst times. Several years ago here in West Michigan a man who was diligent about always locking up his handgun, left the gun out because the batteries were dead in his hand gun safe. Tragically, a child was killed when a sibling picked up the loaded gun. Override keys. Since batteries can go dead there needs to be a second way to open most hand gun safes. These back-up key locks are vulnerable to being picked open. Electronic locks can have short lives. We frequently hear complaints about electronic locks, especially “finger print” versions, lasting only two or three years. At Hoogerhyde Safe we strive to provide security in addition to convenience. 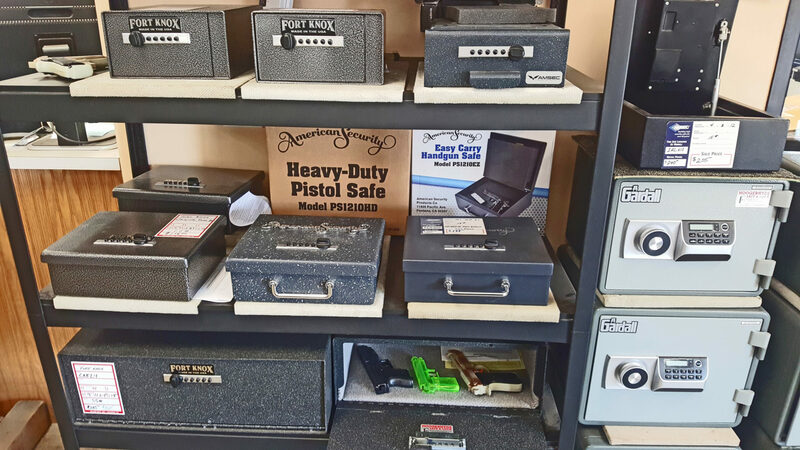 While we do sell a few light duty units, we strongly encourage folks to buy handgun and pistol safes with heavier steel and stronger latch systems. For example, Fort Knox pistol safes have bodies that are 10 gauge steel, which is 281% thicker than 18 gauge, and 375% thicker than 20 gauge. Doors are made of 3/16” steel which is 392% thicker than 18 gauge and 522% thicker than 20 gauge. 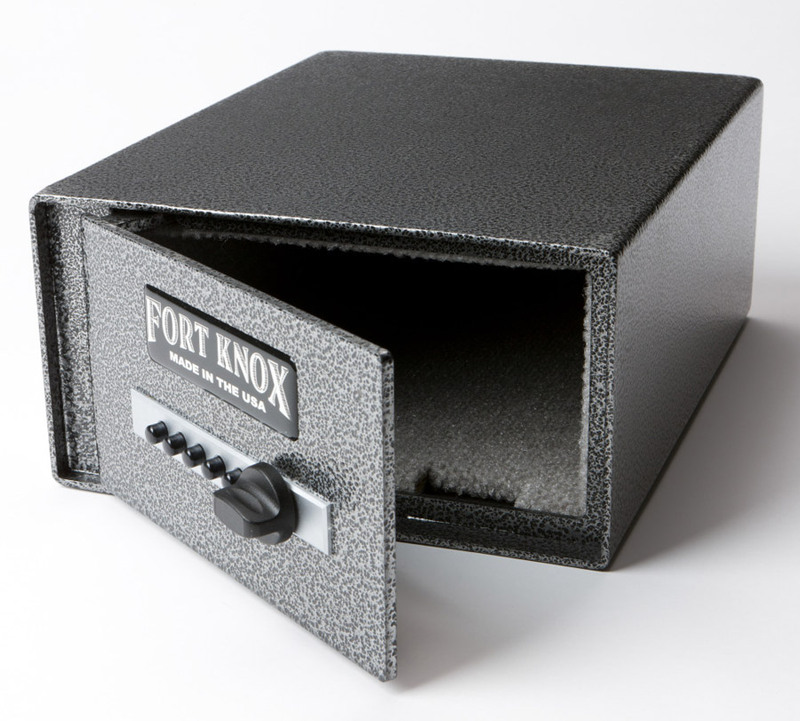 Fort Knox’s “Original Pistol Safe” is our best seller. American Security’s PS1210Hd is like the Fort Knox “Original” but adds a carry handle. The majority of pistol safes we sell have mechanical Simplex brand push button locks rather than electronic locks. Mechanical locks can be just as fast, with no batteries. Simplex locks have been around for a long time, tested in all kinds of applications. Their latch bolts are 1” X ½” solid steel vs. a wimpy little wire catch on many box store safes. 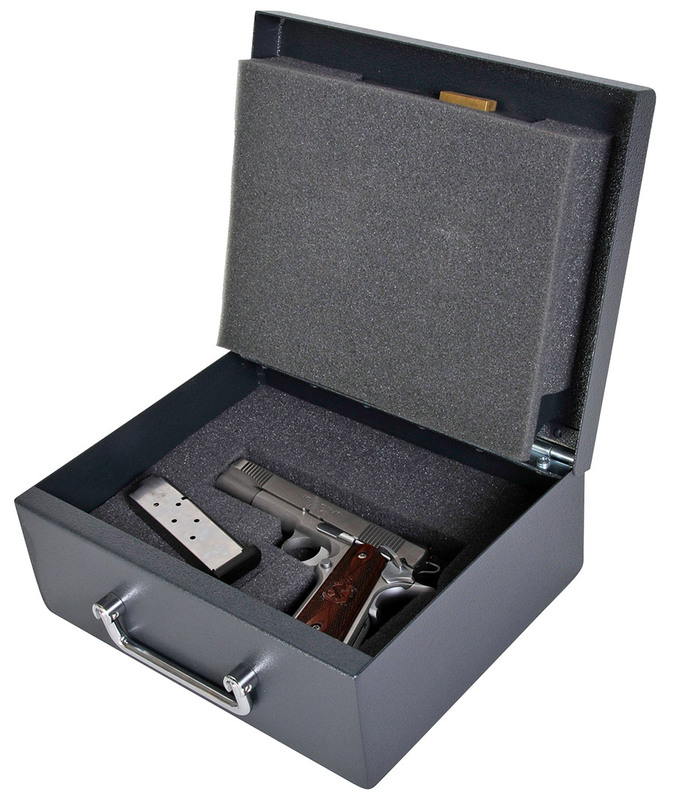 We offer a variety of sizes and configurations in pistol and handgun safes. Whether you want a product for near your bed, under your bed, bolted on top of a shelf or to the underside of the shelf, in a drawer, or in your car, we can help you find the right unit. All the products we carry can be bolted down and/or to a wall. 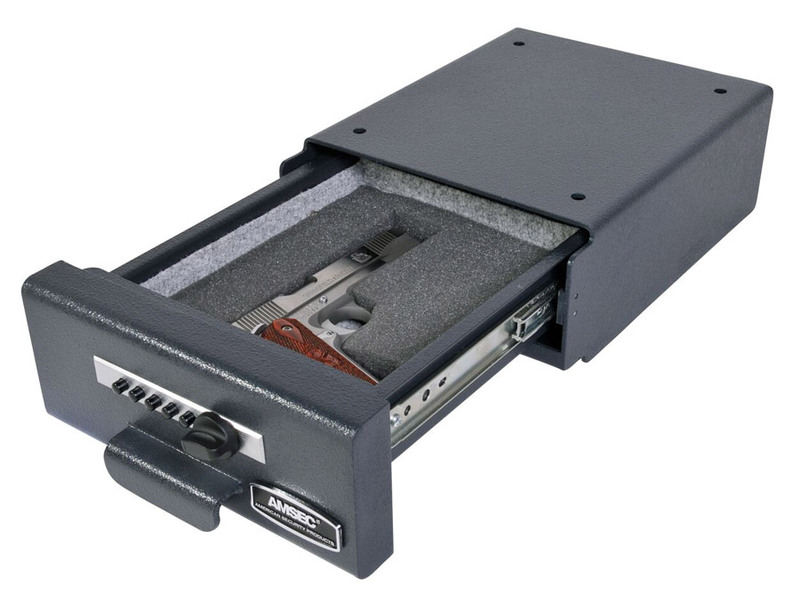 Most hand gun safes hold only one or two guns, but Amsec’s IRC Drawer Safe will hold three. We recommend Fort Knox’ CAB 20, 24 or 28 series if the customer wants to store up to ten pistols. On the other hand, many women like the Fort Knox Auto Safe because its small size is perfect for the smaller hand guns most women prefer. Some units like Amsec’s EST813, EST916 and EST1014 are not specifically pistol safes but are frequently used in the bedroom to hold jewelry or other items in addition to a hand gun. In general, handgun safes have no fire resistance. When fire protection is important we recommend Gardall’s Microwave safes. They have one-hour fire ratings with fast, dependable locks. Choosing your handgun or pistol safe shouldn’t be an impulse purchase at a box store or gun shop. Come to Hoogerhyde Safe in Grand Rapids, Michigan for assistance in choosing the best pistol safe for your needs.